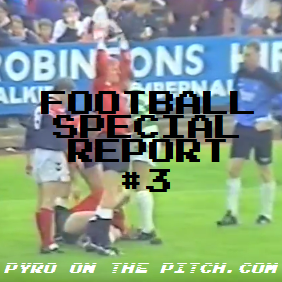 Last time on the Football Special Report we looked at a heated clash in Derry from 1994 and some preceding League of Ireland supporter history. We now take a quick hop through time and space across to their celtic (pronounced “keltic”) cousins in the Scotland of 1992, for the quite appropriately named Celtic (pronounced “seltick”) of Glasgow and their hosts Falkirk (proncouned “falkirk”) of Falkirk. There are several things of note about today’s featured match that collectively exemplify association football in the era. 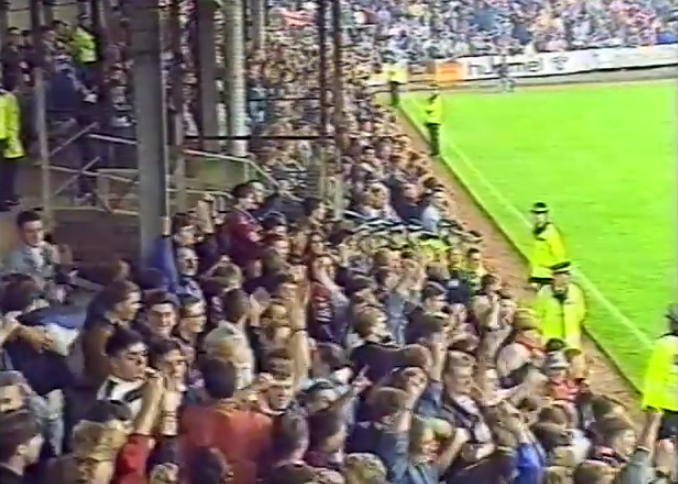 Besides kit fashion and ground configuration, this included the reality of potential crowd trouble at basically any given game, even if a general downturn had occurred down in England at the end of the ’80s. But Scotland of course had their own fan culture scene, in which besides the obvious Old Firm and everything that went with it, Aberdeen can claim status as among the godfathers of the casual movement. There is also the anomaly of Dundee and Dundee United Sharing a firm, the excellently named Love Street Division of St. Mirren, and Aberdeen again being able to claim the earliest UK ultras group in the Red Ultras (slightly unimaginatively named in retrospect, but revolutionary for the time). 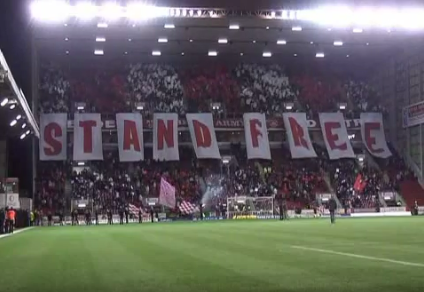 A display from Aberdeen's Red Ultras from a 2006 game vs Rangers. The innocence of it. On the same day, there had also been trouble at Dumarton FC’s fixture against Hearts, when visiting supporters were changing ends at half time. Several arrests were made to cheers from the “normal” fans. At a national level, those down south would quiver in fear at the regular visits of Scottish hordes for British Home Championship games and club encounters alike, with a reputation for drunk and disorderly behavior. Statistically, alcoholism was five times more likely for a Scot than an Englishman as of 1967, and the stereotype was not helped by the likes of a Newcastle vs Rangers Fairs Cup semi-final in 1969 that had to be held up for 20 minutes due to rioting Rangers fans, and a friendly between Aston Villa and Rangers in 1976 that was called off for the same reason (games themselves both worthy of an article, but unfortunately footage does not seem to exist of either). One of the most famous mass pitch invasions of all time occurred the following year at Wembley, after Scotland secured the Home Championship with a 2-1 victory over England in June 1977. During the celebrations – the highlight of which revolved around the destruction of the Wembley goalposts – commentator John Motson remarked how there had been a pitch invasion of the same sort from the Scots ten years earlier, and while fences were popping up at grounds around the country due to the general increase in crowd trouble, Wembley had yet to install their’s so the visiting supporters were free to encroach again here. He also mentions how these scenes of chaotic jubilation are “so typically Scottish”. The goals come down as Scotland celebrate the 1977 British Home Nations championship victory in Wembley. A few months later and the Tartan Army would be on English soil again, this time for a crucial World Cup qualifier away to Wales that was actually played at Liverpool’s Anfield Stadium. Wales had seen crowd trouble of their own when Yugoslavia were the opponents in Cardiff’s Ninian Park in 1976, and as a result the potentially volatile visit of the Scots was moved out of the usual national team home ground. The Welsh FA chose revenue over home-advantage by selecting to play the game across the border at the larger Anfield in order to sell more tickets, rather than Wrexham’s smaller Racecourse Ground. Unlike Wembley, Anfield was in fact equipped with fences, which was a good thing for those intending to maintain order on the pitch, but in the terraces it was a different matter. The many thousands who had made their way down south for the game erupted into an epic sea of ecstatic chaos on the huge terrace behind the goal for Scotland’s two strikes late in the game, which secured World Cup qualification. Doubtlessly this would have spilled onto the pitch if not for the fences (as we have seen before at the same fixture 11 years earlier in People On The Pitch #2) and the amazing pandemonium demonstrated that a football match was certainly not a “family environment” at this time. Scotland fans erupt as their side go 1-0 up "away" to Wales at Anfield in October 1977. But it would be three years later back in Glasgow that Scottish football mayhem would reach it’s nadir, with the 1980 cup final riot between Celtic and Rangers fans. The conflict in Northern Ireland – to which the two clubs were inexorably linked due to their historical community affiliations – was at it’s height, doubtlessly spurring on the already existing tensions between the two huge rivals. After a Celtic victory, things would boiled over on that hot May day in Hampden Park, but as we definitely will be covering this game in full later, we won’t say more until then. 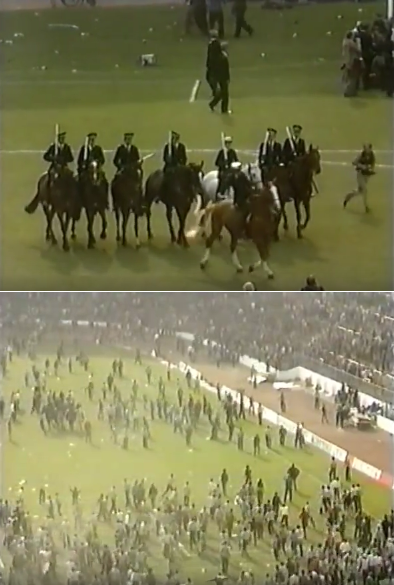 Scenes from 1980 Scottish Cup final riot between Celtic and Rangers supporters. Throughout the following decade, more ogranised hooligan elements would spring up at Scottish clubs as they were doing throughout Britain, but good old spontaneous break-outs of trouble were still always a possibility. Celtic were again involved in another infamous incident at a UEFA Cup game in the mid-’80s that resulted in their following European fixture being played behind closed doors (again, we will come back to this later). An empty Celtic Park as Celtic are forced to play Atletico Madrid behind closed doors in the 85/86 Cup Winners Cup. 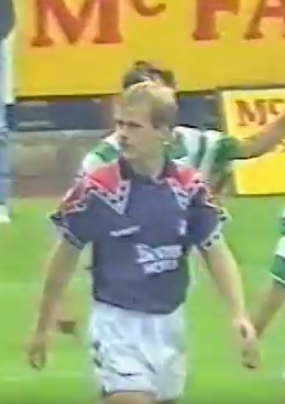 That bring us up the dawn of the ’90s, and Celtic’s visit to Falkirk FC during the ’92/’93 season. Falkirk were a smaller team (although notably their foundation date of 1876 predates Celtic’s by 12 years) not as well known for violence, and today Wikipedia lists their two modern firms as the Falkirk Fear and Falkirk Yoof; names which ironically don’t really instill much fear at all. But while we’re not going to see any mass chaos at Falkirk here, we however will see how even a single individual can sometimes be enough to stop a match in it’s tracks. Visible in the above shot is also the fact that supporters in wheelchairs were positioned right beside the grass of the pitch, behind and to the sides of the goal. This seems heartwarming, but then again also indicates a lack of actual facilitates for such fans, as well as the proximity to goal creating a potentially uncomfortable situation if a particularly ferocious shot were to miss the target but connect with a vulnerable fanatic’s face, nearly surely knocking them clean out of their wheelchair if hit sweetly enough. The game was held up for a few minutes while medical treatment was given, and the veteran ref – who doubtlessly had already experienced his fair share of football “rowdies” – was eventually able to continue. 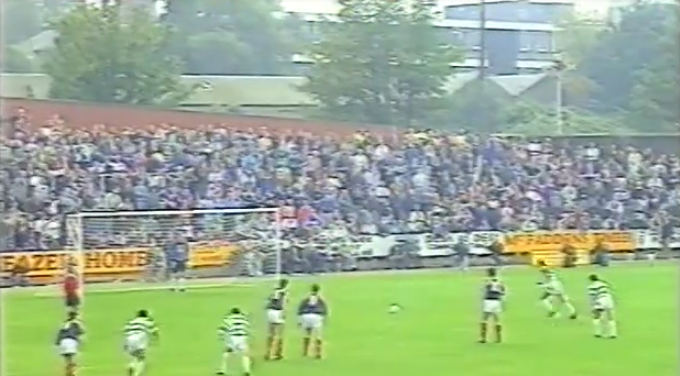 But as we mentioned earlier, here was an example of a “random” lower-key match (albeit massive for Falkirk due the visit of one of the country’s biggest clubs) that had to be delayed due to the crowd; or in this case, a singe member of the crowd. 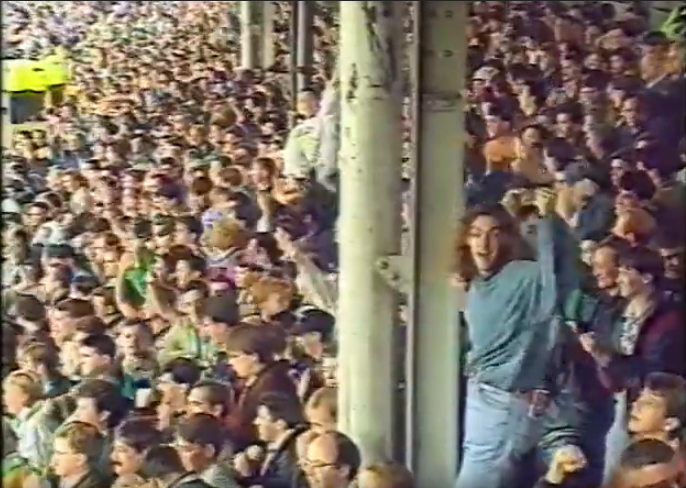 Through a trouble lens, there was not outright chaos as in days gone by (although clearly a good atmosphere), but like with the Football Special Report #2 in Ireland, it was obvious that football in the early ’90s didn’t need oragnised gangs or per-ordained violence for incidents to still occur.